Chris Hastwell in full flight in the Garstang 10k. Saturday afternoon witnessed the fourth fixture in the current season on the Mid-Lancs Cross Country League in Towneley Park in Burnley. Very low cloud and set-in heavy drizzle greeted early arrivals but by the time of the senior races this has abated and was left with the characteristic cold wind gusting across the parkland and playing fields now used for the course. Kath Hoyer was the only Wesham woman running in the 6km course over 1 small, 1 medium and 1 large lap, finishing 4th W55 and 75th in 26:01. Dave Young placed 5th in the Over-70s race over the same course clocking 29:02. Dave Waywell was 6th in 30:07, and Peter Bartlett 7th with 30:48 to win the M70 team from Chorley AC. In the Senior Men’s 10k over 1 small lap and three large ones David Taylor lead the way for Wesham to come in 49th in 35:15. Andrew Harling put in a good run to finish 67th in 36:08. Phil Quibell finished 3rd M60 and 104th in the race overall in a time of 37:39. Nigel Shepherd ran a canny race slipping through on the final lap to take 8th M60 and 202nd overall with 41:49 overtaking John Collier who was fighting off the last of a cold who came in 11th M60 after a battle with Lytham’s Terry Hellings in the closing metres to clock 42:02 for 206th place. Ben Wrigley had a great run to finish 251st in 45:04 with Martin Bates 20th M60 and 258th in 45:26. The Wesham men were 21st team overall; 18th Masters 40+; faring better in the Over-50s with 8th place; and 2nd M60 by 2 points behind Kendal who put out a crack squad. Paul Carter ran the Rivington Nightrunner 10k from the Rivington and Blackrod High School coming in 350th in 1:34:04 over the hills and fells of the West Lancashire moors. Kath Hoyer ran the East Lancashire Hospice 10k at Great Harwood finishing 2nd W55 and 18th woman in 50:23 with 427 runners. There was a good turnout from Wesham at the Lytham Hall Parkrun on Saturday morning. Jonathan Lawson ran 21:55 for an M50 age graded performance of 67.83%. Stuart Topping ran well with a time of 23:19 for an M45 grade 62.26%. Suzanne Leonard was in fine fettle to clock 2347 for a new personal best and a W45 grade of 68.82% with George Kennedy pacing her and coming in with 23:48 for an M60 68.00%. Sharon Cooper ran 24:18 after organising the marshals with 24:18 and a W45 65.36%. Stephen Twist clocked 25:28 for M50 58.84% with Graham Cunliffe running well after New Year in Scotland with a great 26:17 and an M60 grade of 62.08%. Phil Leaver ran 27:24 for M65 61.19% while Nicola Carter clocked 34:08 with a W35 grade 44.09%. Julie Topping ran 34:24 for W45 47.58%. 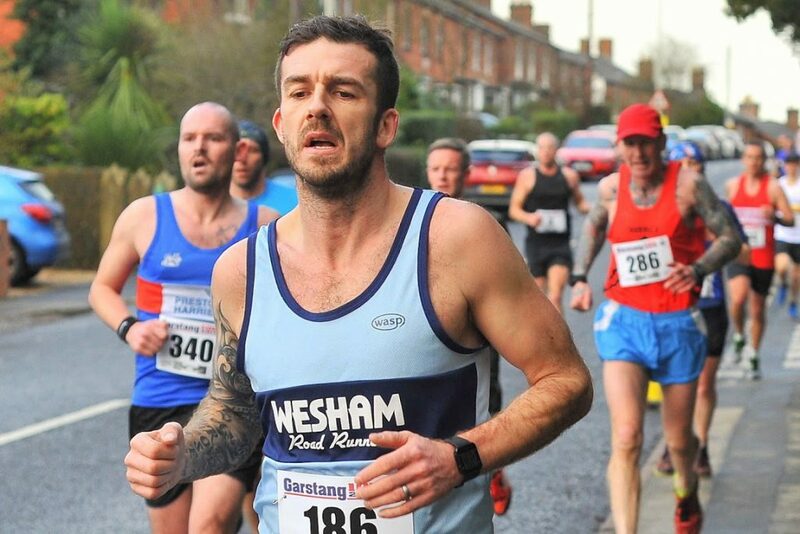 In the Preston run Steve Myerscough ran 20:26 his best run since his comeback for M45 69.41%. Robert Brown stopped the clock at 26:10 for an M60 graded 61.8%% and Lynne Brown had 42:41 W55 43.58%. In St Helen’s Victoria Park Chris Pike ran 26:24 for M40 52:90 and Antoinette Holton was out at Six Hills Way in Stevenage for her 5km in 28:19 and 52:62% for a Senior Woman. The Parkrun Tourists plumped for Horton Park in Bradford; Vicky Gore ran 27:51 for a W40 performance of 56:07 with Steven in supporting role 1 second behind in 27:52 both as First Timers, In Blackpool’s Stanley Park Helen Lawrenson was the fastest woman with her time of 22:00 for W45 73.30%; Dave Marsland recorded 24:09 and M60 68.18% while Andrew Moore clocked 26:09 with M55 59.78%. John Sharples made a comeback with a First Timer performance of 36:11 for M60 45.51%. At Fleetwood Promenade Peter Cruse put in the second fastest time of the day with 21:04 for an M55 grade 73.58; Carl Groome ran 23:40 for M50 62.32%; Sue Rigby ran 31:55 and W45 49.77%; and Brian Jones 32:01 for M55 48.83%.